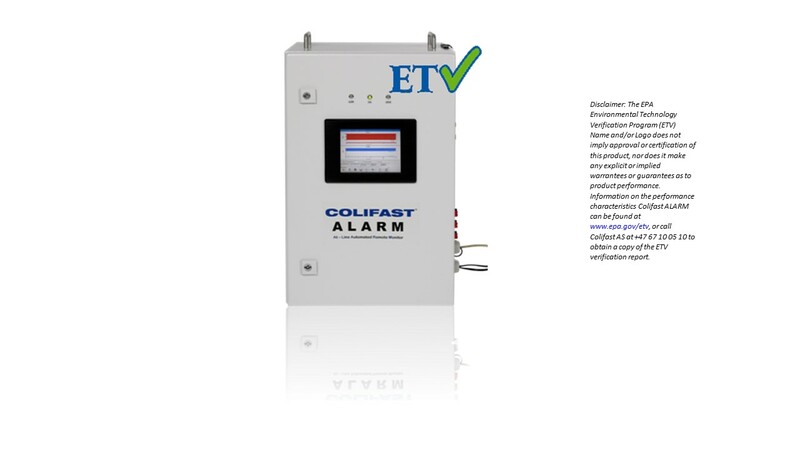 The Environmental Technology Verification (ETV) by the United States Environmental protection agency (US-EPA) conducted a thorough testing of the Colifast ALARM . Preparations of samples containing close to 1 organism per 100 mL water was acquired to test the sensitivity of the apparatus in accordance with the EU directive and recommendations from the WHO of 0 organisms/100 ml, and thus also the standards for the Colifast ALARM . Commercial cell lines were used to prepare these samples, but also filtered contents of sewage to better simulate the in situ conditions. All samples underwent chlorination for adjustment to target level, followed by dechlorination. Results gotten from the Colifast ALARM and a reference method (SM 9221B and F), were compared statistically using the Chi-square test for independence followed by the Yate’s continuity correction. No significant differences between the tests were proven in the report. The US-EPA also compared the Colifast ALARM and Colilert-18, where the statistics showed a difference between the two methods. The growth conditions in the two systems differ slightly and might explain the difference observed by the US-EPA. The Colilert-18 medium facilitates unspecific growth of more than coliform bacteria, and the E. coli-distinguishing feature is acquired purely based on the measurement of enzyme activity. On the contrary the Colifast ALARM runs on medium that inhibits growth of non-coliforms, and while gaining selectivity this slightly harsher treatment results in a slight loss of sensitivity. The selectivity components of the Colifast medium are more similar to the traditional ISO and American standard methods than the Colilert-18, and thereby no difference on the sensitivity is found when comparing Colifast with these methods. About ETV: The goal of the ETV program has been to verify and inform the public of the performance of technology that can solve problems related to the public health and the environment. The ETV program collaborates with organizations conducting recognized standards and testing in order to ensure that the data generated are both reliable and defensible. In the EU validation scheme, three institutions tested the Colifast Analyzer (CA, discontinued instrument) or the Colifast At-line Monitor (CALM). Both E. coli and P. aeruginosa samples were collected from drinking water and swimming pools, respectively depending on the test. The samples were tested on the Colifast instruments where fluorescence is measured as a result of the enzymatic activity specific to an enzyme found in the target species. A synthetic compound where a substrate is fused to a fluorescent probe generates an increase in fluorescence when the specific enzyme is present and can “activate” the probe by cleavage. The instrumen t runs several simultaneous samples and utilizes the most probable number (MPN) statistics to estimate the original bacterial count of the source. 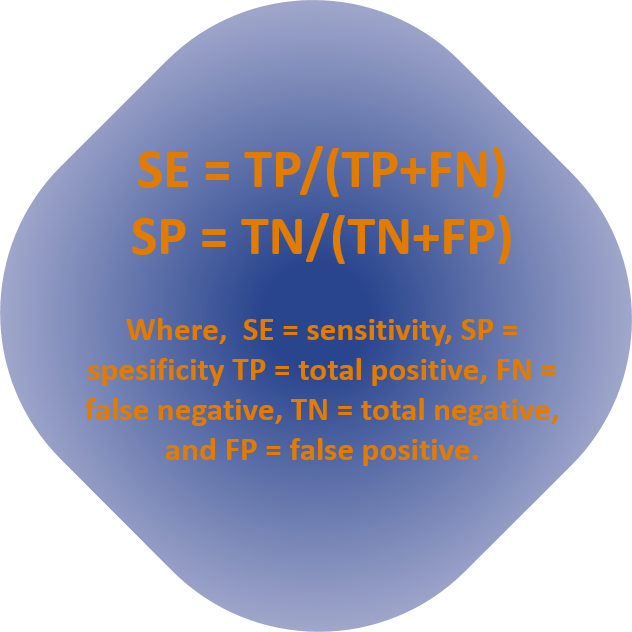 By diluting samples to such an extent that both positive and negative samples are achieved, the fraction of positive samples can then be used to do the estimation. Parallel reference methods were conducted, ISO 9308-1 for E.coli, and EN 12780 for the P. aeruginosa. The MPN method is well tested, thus the focus of this report was to measure sensitivity and specificity of the Colifast method. At the Instituto Superiore di Sanitá, a 97 % specificity and 98 % sensitivity and no significant difference between the Colifast method (14 h incubation time) and ISO 9308-1 method when 522 samples were compared for E. coli. The data for the P. aeruginosa, from 441 samples gave a sensitivity and specificity of 99 % and 98 %, respectively. From the Ecole Nationale de Santé Publique, 245 samples were tested for E. coli and the resulting sensitivity and specificity was 97 % and 93 %, respectively.